This page is about the aircraft G.91 YS. For other uses, see G.91 (Disambiguation). 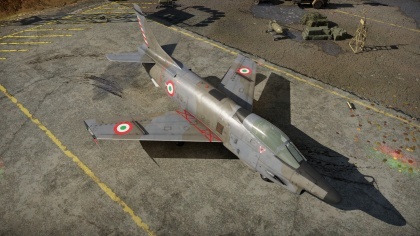 The G.91 YS is a rank VI Italian jet fighter with a battle rating of 9.3 (AB/RB/SB). It was introduced in Update 1.87 "Locked On". 1 128 371 ??? ~?? ~? Great turn speed for a jet; on par with the MiG-15 in this area. Can equip with AIM-9 Sidewinder missiles. Wide variety of payload options. Two 30 mm DEFA cannons cause more damage than the original 4 x M3 Browning machine guns. Nearly every foe at its rank (ex. F-100D, MiG-19) are faster. Fairly low ammo count for the guns means that you need to be conservative with your ammo. 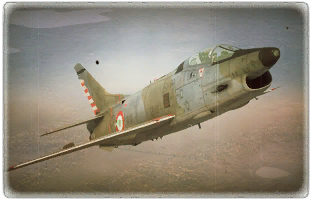 During the 1960s, Fiat began developing a successor to their previous G.91 fighter, which had thus far managed to obtain a favorable reputation with its operators. Fiat based their new aircraft heavily on the two-seat trainer version of the G.91 and decided outfit the aircraft with two General Electric J85 afterburning engines contrary to the preceding single-engine G.91. Additionally, the aircraft’s fuselage and wings were enlarged to accomodate for the bigger powerplant and improve handling characteristics, while a slew of other tweaks and upgrades further enhanced the aircraft’s overall design. The new G.91Y performed its maiden flight in December 1966. Testing revealed minor aerodynamic issues which would be resolved on subsequent production aircraft with only minor redesigns. Production of the G.91Y began with an initial order for 20 pre-production machines, following the manufacturing of two prototypes. This order would eventually go up to 75 aircraft, although only 67 including the initial prototypes were delivered in the end. By the mid 1970s, all outstanding orders for the G.91Y were fulfilled and production had ceased for this variant. The G.91Y served exclusively with Italian squadrons up until the early 1990s, before being replaced by a more modern counterpart. The G.91YS was a single prototype conversion of the G.91Y, which followed a requirement issued by the Swiss Air Force. The aircraft allowed installation of American Sidewinder air-to-air missiles, and a Swedish weapons control system. This special prototype first flew in October 1970, but was eventually not accepted into service by the Swiss. The prototype was converted back into service as a regular G.91Y. This page was last edited on 31 March 2019, at 14:25.